The Flynn & Tonics are an outstanding wedding and party band based in the North West of England. 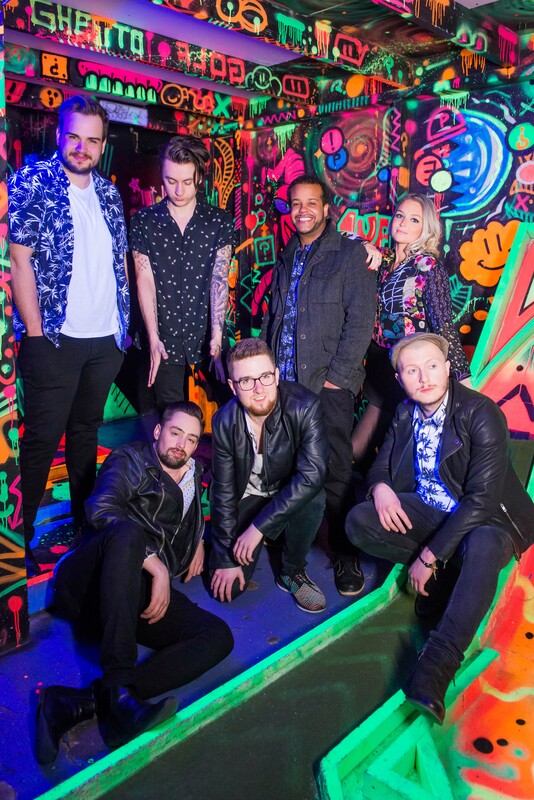 Employing a wide variety of music ranging from Motown, soul, funk, disco and pop, the band prides themselves on their ability to fill the dance floor at any event they play. Whatever the occasion, The Flynn and Tonics’ polished stage show and refined musicianship will deliver a night your guests will never forget! "They were true professionals but very much also down to earth and made our evening such a dream." The Flynn and Tonics are a Liverpool-based band that have been performing all around the UK at weddings, parties and corporate events since November 2011. All the band members met whilst studying at Paul McCartney’s Liverpool Institute of Performing Arts, and have since graduated with BA (Honours) Degrees in Music. The band has a standard 6-piece lineup, but can also perform with as little as 4 and as many as 9 musicians. 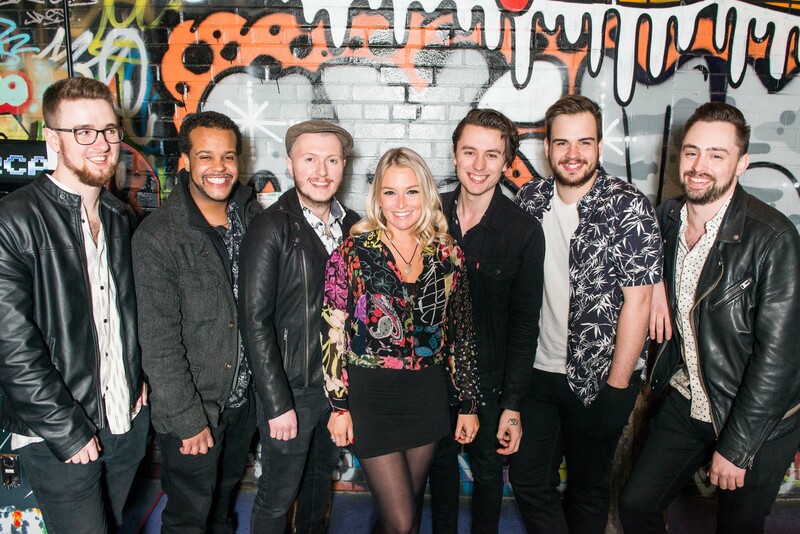 Fronted by an energetic and engaging lead singer, The Flynn and Tonics have a polished and professional stage show, performing the best dance hits from the last 60 years. Each member of the band are successful session musicians in their own right, having toured and recorded in Spain, Norway, France, South Africa, Canada, Italy, Jersey, and America. The band is completely self-contained, and can provide professional audio and lighting equipment for venues up to 250 people. "The venue came alive when the band took the stage! " The Flynn & Tonics will take all the stress out of booking entertainment for your event. 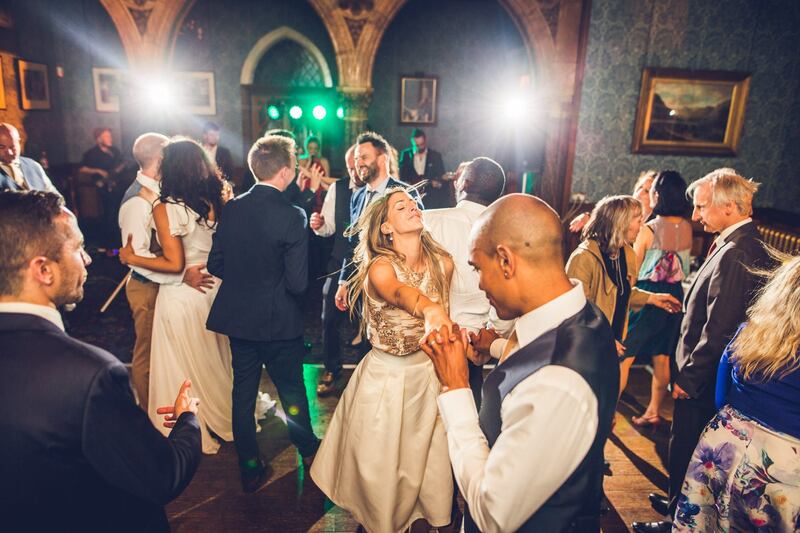 The band comes with exceptional lighting and audio equipment, and can also provide a full-request DJ Service to keep your guests dancing whenever the band isn’t playing! This is our most reduced form of the band. Still a great setup delivering a high energy and a fine sounding stage performance! Our second most popular setup, this arrangement takes advantage of adding a keyboard and synth player to really fill up the sound and add a whole new dimension to the performance! The original band setup. This arrangement is comprised of all the original members of the band, and has everything required to completely fill the live sound spectrum and deliver everything that could be expected of a live party band. The added saxophone/percussion player is the metaphorical cherry on top, and brings the whole performance together. Adding a trombone player to the stage really helps to bring out the classic sound of the horn section, which is so important to the sound of motown and funk. This is the setup we play with when we do public gigs in bars and restaurants. Adding a trumpet to even further bring out the sounds of the horn section. The largest setup we have. On top of the full horn section, we will bring in a professional percussionist to take the sound even farther, and bring on a whole new dimension of energy to the performance. A typical set for the band is 2x 45 minutes, with a short break in between. We can also offer 3x 30 minute sets, 3x 45 minutes, 2x 60 minute, or any other combination you would like! The Flynn and Tonics are happy to provide a full-request DJ Service from a library of over 80,000 songs. This is a great way to keep your guests dancing throughout the evening! We are happy to offer an acoustic duo (vocals and guitar) or trio (add saxophone) service to our clients. This is usually for earlier in the evening, to provide background music for guests, for example, if they are having a meal. The set list would be much more laid back and relaxed tunes, as to set a very calm mood for the guests. A typical service would be 1x 45 minute set or 2x 30 minute sets. To see our acoustic song list, please fill out an enquiry form below! "This ended up being the best birthday ever, thanks to you and your amazing band! "We could not have asked for more"
"You guys were fantastic! All our guest have been calling us to say how good you were!" Our price greatly varies depending on where the venue is, what the date is, and which services are required. If you would like a price quote for your event, please feel free to fill out an enquiry form at the bottom of the page under the “Contact Us” tab, or call David on (+44) 7715 275810. If filling out an enquiry form, please state the address of the venue, the date of the event, how many musicians you would like, set lengths, if you need a DJ service, and any other services or special requests in order to get the most accurate price quote! Would we need to pay a deposit? A £200 deposit will be taken upon booking the band, and the remainder will be paid in cash on the day of the performance, or via bank transfer no less than 5 days prior to the performance. What does the band supply? We will supply all necessary equipment, including suitable Audio and Lighting gear for up to 250 guests, any more than this and we will need to rent larger equipment. What does the band require? The band requires a performance space of at least 5x3m and two mains plugs. A hot meal and soft drinks will also be required for the hungry musicians at some point during the evening. If possible, a separate room for the band to get changed in would also be nice! Does the band have all the necessary insurance documents? The band has up-to-date PLI and PAT certificates and would be happy to email them over. Where can we see the band play live? The Flynn & Tonics currently hold a residency at Heebie Jeebies on Seel St. in Liverpool. Performing there every Wednesday night from 11pm-3am, it is a great way to see how the band can work a crowd and give a great performance! Please note: if planning to see the band live, please call David on (+44) 7715 275810 before you leave the house, sometimes we have to cancel due to other gigs so call to make sure we are playing that evening! Feel free to fill out an enquiry form below! Please be sure to include the date and address of your event. © Copyright 2013. Flynn and Tonics. All Rights Reserved.